What Can Be Done About Dog Fouling? 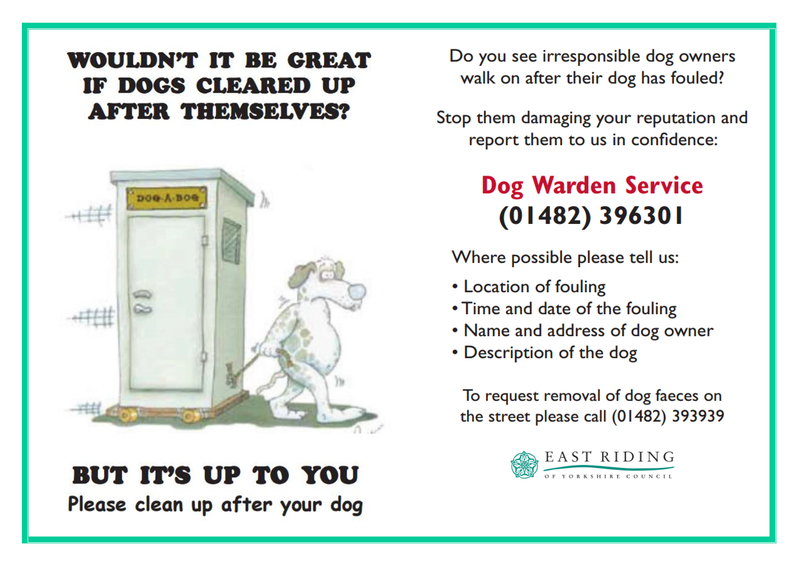 Local laws in the East Riding (Public Spaces Protection Orders) make it an offence not to clear up after your dog has fouled on any public land. 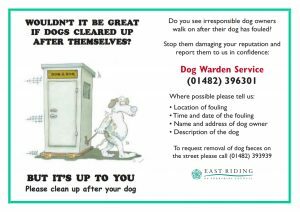 If you want to report dog fouling, and you know the offender or have a description and when the fouling is happening, the Dog Warden Team can investigate this. Please call the Dog Warden Team on 01482 396301. Please call Streetscene Team on 01482 393939 to report a littering offence, including dog fouling, and would like this to be removed. This service can also be used to report a full litter bin. This Streetscene service can also be used to report a full litter bin. Dog fouling remains one of Tickton & Routh Parish Council’s top concerns. It is the most offensive type of litter on our streets and it is consistently raised as a public concern. To help combat the problem of dog fouling the Parish Council has purchased two Dog Waste Bag Dispensers. These have been installed near to both bus shelters on Main Street, Tickton and are located near to a bin to enable owners to dispose of this waste. Please report an empty dispenser to the Parish Clerk by email: info@ticktonandrouth.org.uk or call and leave a message on 07563 155095. The Dog Warden attended the Parish Council meeting held in October 2017 and confirmed that the Dog Warden Team visits the Parish on a random basis. Any owners caught allowing their dog to foul without picking up will be subject to prosecution. All East Riding of Yorkshire Council litter bins may be used for disposing of bagged up dog waste collected whilst walking your dog. If anyone leaves bags of dog waste on trees, bushes, the base of a lamp post etc. they are committing a littering offence that may also be punished by way of a £75 fixed penalty being issued. It is the the responsibility of the dog owner or the person in charge of the dog to clear up any dog foul left by their dog. If you fail to clean up after your dog you can be issued with a £75 Fixed Penalty Notice , or if the case goes to court a fine of up to £1,000. Please help keep our streets clean – Please clean up after your dog.